If we’ve had the privilege of going to your school for the BrightSparks talk recently, you’d probably have gotten some insights into 2015’s BrightSparks Survey findings – results derived from the responses of your seniors. We gave you a look at their scholarship providers of choice, their preferred work industries, and some of their scholarship-related concerns. Results indicated that two scholarships from the healthcare industry made it into the 10 most preferred scholarships, alongside scholarships from the aviation industry (such as the CAG Undergraduate Scholarship, SIA Open Scholarship and CAAS Local Undergraduate Scholarship), the EDB Scholarship, JTC Undergraduate Scholarship, the SgIS, the PSC Scholarship and the MOE Teaching Scholarship! This year, the BrightSparks survey is running once again as per the past nine years. This is your chance to make known your scholarship preferences and concerns as well as what you feel are important attributes of an ideal job. Your responses will reach scholarship providers and enable them to better align their offerings with some of your preferences. For instance, if developmental opportunities matter significantly to you, scholarship providers will see more reason to put enhanced programmes in place and have you play a hand in charting your career. They will also have a clearer understanding of the channels to reach you should they wish to let you in on essential scholarship information! In perusing the survey questions, thinking through your options and indicating your choices, you are converting your thoughts into something perceivable. For instance, in identifying that a CAG Undergraduate Scholarship appeals to you, you unknowingly reflect upon the reason of your choice and determine your preference consciously. You may not realise it, but this helps to crystallise your goals and possibly give you added impetus to strive towards them. 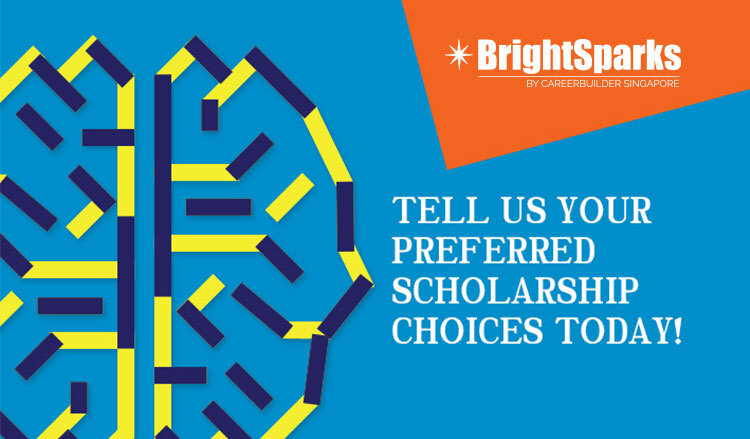 All in all, the BrightSparks Survey will give you the opportunity to contribute to the overall scholarship outlook of 2016. Which scholarship providers will be in the top 10 this year? Which work industries will see the most students setting their hearts on? Only one way to find out: take the 2016 BrightSparks Survey today! Click here if you are an ‘A’ Level graduate / Year 3 Polytechnic Student, and here if you are a University Year 1 or 2 Student.